Florafelt Vertical Gardens and Living Walls present a whole new way to think about gardening. 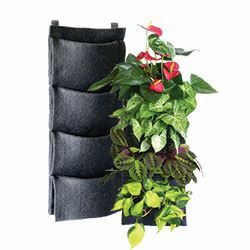 Grow a living wall is easy with the Florafelt System. The handmade pocket planters and robust Pro Systems are designed to use the micro fibers in PET felt so that all the plants are watered equally. Florafelt is made from recycled plastic bottles, a nylon non-toxic fiber that is indestructible. This amazing material provides a safe growing medium that is pH neutral and non-reactive so you can garden organically right on your wall. It’s especially safe and suitable for vegetables and herbs. Roots grow right into the felt, which comes alive thanks to the microbiology in the soil. Planters also come with a customizable Root-Wrapping system that lets you change and arrange your living wall at will, while maintaining the integrity of every plant in its own soil. 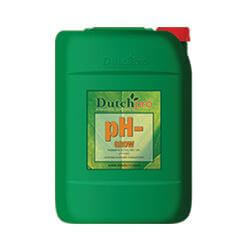 Dutchpro pH- Grow reduces the pH value in a garden during the growth stage. This product contains 38 per cent nitric acid, so caution must be used while handling and storing. To use, growers add small amounts of pH- Grow during the growth stage until the desired pH level is reached, keeping in mind the recommended pH level for most plants during the bloom stage is around 5.8. Dutchpro pH- Grow comes in a wide variety of sizes and is compatible with many types of media. 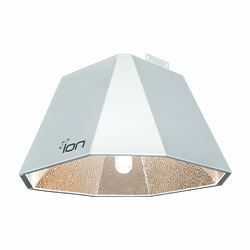 Say goodbye to the high heat and power consumption and EMI of other HID systems with ceramic metal halide technology from ION. Designed specifically for use with ceramic metal halide lamps, the ION CMH 315W Electronic Ballast powers highly efficient light output at a modest wattage, while the microprocessor’s lower operating frequency produces minimal electromagnetic interference. A full list of integrated features optimizes system performance, lengthens lamp life, and promotes safe operation. Pair the ballast with the base-up ION CMH reflector for a balanced footprint free of hot spots. ION CMH products are safety certified, adaptable to a range of voltage set-ups, and well-suited to single- and multi-light configurations in both hobby and commercial applications. Introducing the industry’s first 4K double-ended CMH bulb. The Grower's Choice DE 630W 4K CMH/LEC Grow Lamp runs in any double-ended, high-frequency ballast if it is dimmed down to 600W. 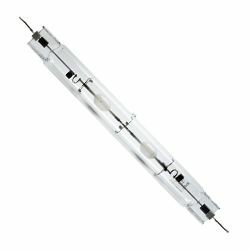 Now, growers can enjoy all the benefits of costly LEC systems by simply switching out the bulb in their existing fixture. Due to its proprietary spectrum, the Grower’s Choice CMH 4K bulb offers an unbeatable CRI of 98, making it the closest solution to sunlight available on the market. The 4K bulb is a perfect veg bulb, offering thicker branches, tighter node spacing, and bushier growth, which leads to higher yields. This product offers the efficiency of a DE system and the spectral quality of an LEC combined into one. A Hydrofarm exclusive, the new Jump Start Attachable Lighting System is specifically designed to work with the oxyCLONE 20-Site cloning system and the Back To The Roots water garden. It’s perfect for providing beneficial light to seed starts, cuttings, herbs, and leafy greens. 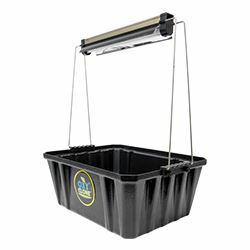 The 12-inch T5 fluorescent tube and built-in reflector provide adequate light, while the integrated clips attach securely to the oxyCLONE or water garden. Like all Jump Start T5 fixtures, the reflector in this system uses highly reflective Omni-Max film. Its clever design allows for great flexibility in the reflector angle of the fixture, which can be changed to direct the light spread from one side of the plant canopy to the other, as desired. Includes an eight-foot 120V power cord and carries a one-year warranty. 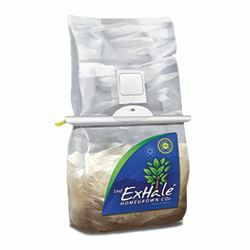 ExHale CO2 Bags produce CO2 for a minimum of six months to offer a 20 to 30 per cent increase in yield. Trusted by garden enthusiasts, ExHale costs only 18 cents a day; a small investment to make for guaranteed results in your indoor garden. ExHale is maintenance-free, produces no heat, and doesn't require electricity. With their award-winning genetics, ExHale helps take your garden to the next level of success: healthier plants and a better finished product. Proudly made in the US by fellow gardeners, the staff at ExHale stand behind their products 100 per cent and think it’s time growers give their garden what it wants and needs. All new for 2017, the patent-pending PhytoMAX-2 series of LED grow lights from Black Dog LED build on our more than six years of experience with LED grow lights, incorporating numerous technological and engineering advancements to deliver unprecedented PAR levels and efficiency to maximize yields. With PhytoMAX-2, we have delivered the most powerful and reliable, truly full-spectrum (365-750 nm, UV to NIR) LED plant grow lights. PhytoMAX-2 uses only the highest-quality, latest-technology, top-bin LEDs sourced from the industry leader for the particular wavelength, such as Cree and Osram, to deliver our proprietary full-cycle Phyto-Genesis Spectrum ® evenly over the entire footprint. 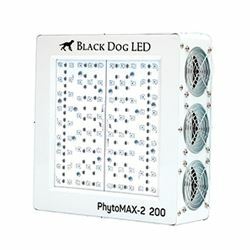 Since 2010, Black Dog LED has sold the most powerful LED grow lights available, and continuing the tradition, a single PhytoMAX-2 1000 fixture delivers an average of 930 PPFD, edge-to-edge and corner-to-corner over a 4x4-foot footprint. Every light is now made in the USA, ETL certified, and comes with a five-year warranty. Imagine running two different timing schedules from the same timer. Growers have been asking for this timer for some time and Titan has delivered with their new Tital Apollo 18 Dual Outlet Timer. The Apollo 18 has two separate timing schedules and can operate two different appliances simultaneously. 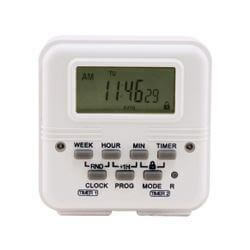 This timer features up to eight total timing schedules. Easy-to-use, built Titan-reliable, and affordably priced, this is a must-have, breakthrough product for indoor gardeners. The sturdy enclosure resists dust, rust, and moisture in the often-damp garden environment. This precision digital timer provides the grower with the perfect timing solution to operate cloning machines, CO2 systems, pumps, fans, or other 120V appliances. 15A/60 Hertz.